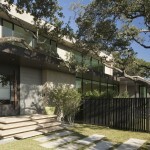 Brian Dillard Architecture have designed the Villa M in Austin, Texas. 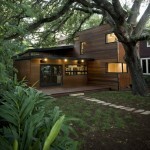 Villa M was designed by Brian Dillard Architecture for a client with Southern French roots living in Austin, Texas. 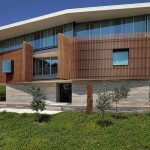 The Austin architect wanted to embrace the owner’s heritage along with his appreciation for contemporary architecture, classic design, bright colors, and outdoor living. 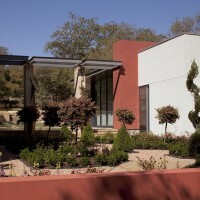 The house is organized around a central pool and garden area that is shared by the main house and pool house. 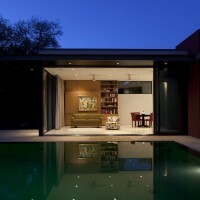 Both enjoy large, multi-slide doors which open the spaces completely to the pool during nicer months. 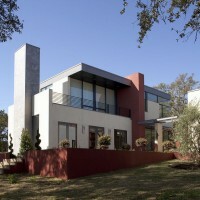 The red stucco volumes are inspired by the vernacular stucco of Nice, France where the owner is from. The parterre garden, tiled pool, and fountain along a central axis are also reminiscent of French influences. 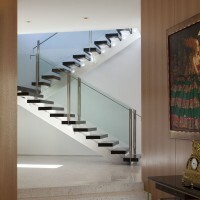 Strong design elements including the bright colors and general form of the house are softened by the use of classic, warm materials such as white oak wood paneling, terrazzo floors, and lueders limestone exterior pavers. The client’s furniture, Murano glass light fixtures, & art from the Saint Paul de Vence galleries further serve to further warm the spaces and reinforce the owner’s French legacy. 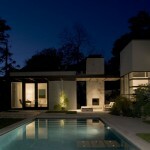 Visit the website of Brian Dillard Architecture – here.